Hate your handwriting? Let us help. We offer a design-oriented addressing service (meaning it's gonna knock your guests' socks off when they see it in the mail!) for all of your envelope needs, whether it's the same address on each envelope or it's hundreds of different addresses for many recipients. 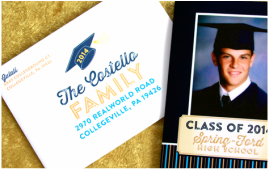 Best of all, we apply the same awesome graphics and fonts used on your invitation suite (that we designed) so it all matches! 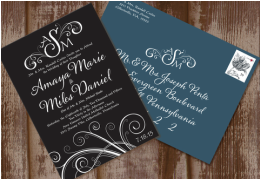 After we set up your envelope file, we will print your envelopes to match your invitation (or other enclosure). 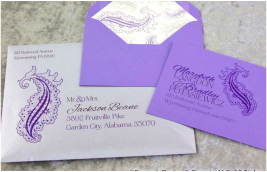 We have a huge assortment of colored envelopes to choose from in matte and shimmery metallic finishes. For use on dark colored cardstocks and envelopes (including variable data on envelopes). This feature used to only be achieved through expensive printing methods by making a printing plate, but we now have a digital white ink printer in our design studio. Beautiful possibilities await!